Important early map of the English colonies in America. The English Empire in America, Newfound-land, Canada, Hudson Bay etc. 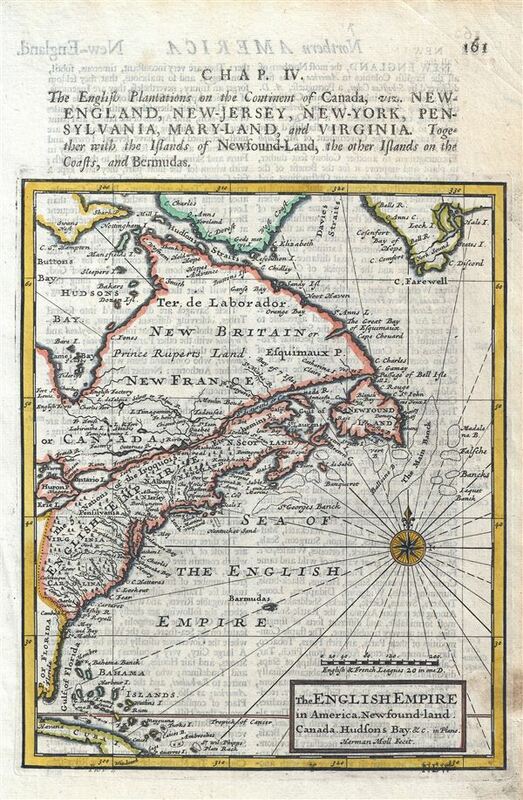 This is a fascinatine 1701 map of the English possessions in North America by Herman Moll. The map extends from Cuba north to Davies Strait and southern Greenland and covers the eastern portion of the United States and Canada. It notes numerous rivers, place names, lakes, cities, islands and a host of additional cartographic and topographic features. Several coastal features including sounds and banks are noted. Lake Ontario is noted along with parts of Lake Erie and Lake Huron and important settlements of Plymouth, Boston, Baltimore, Philadelphia, Carleston and Jamestown are identified. The five nations of the Iroquois is noted across the map from Montreal to Virginia. The Iroquois Cenfederacy consisted of five Indian tribes of Mohawk, Oneida, Onondaga, Cayuga and Seneca. These five tribes (later six, including the Tuscarora, who joined in 1722), played an important part in the stuggle between the Fench and the British for control of North America. This map was issued in the 1701 issue of Herman Moll's System of Geography. Boston Public Library, Leventhal Map Center, G3320 1723 .M65x.